I love that Ecobudz are doing their bit in the grand scheme of things by providing fresh and funky clothing for kids with an emphasis on eco-friendly. The Ecobudz Splat tee pictured above has caught our eye with a design that’s nothing short of fun. Kids will be sure to think it’s a hoot wearing a ‘messy’ shirt. My four-year-old often ends up wearing more paint than the paper when we tackle art but it somehow doesn’t quite have the same effect as this unique tee. Funny that. Ecobudz use a blend of organic cotton and bamboo in their garments for beautifully soft bodysuits and tees. Ecokidz know what kids want, with lots of colour, big graphics such as dinosaurs, bugs and beetles, and no itchy labels to annoy sensitive skin. 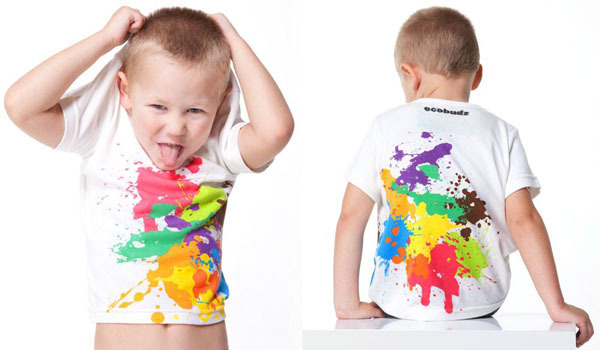 You can buy the Ecobudz Splat tee in sizes to fit one to three-year-olds at Sustainababy for $39.95, with delivery available all over Australia.